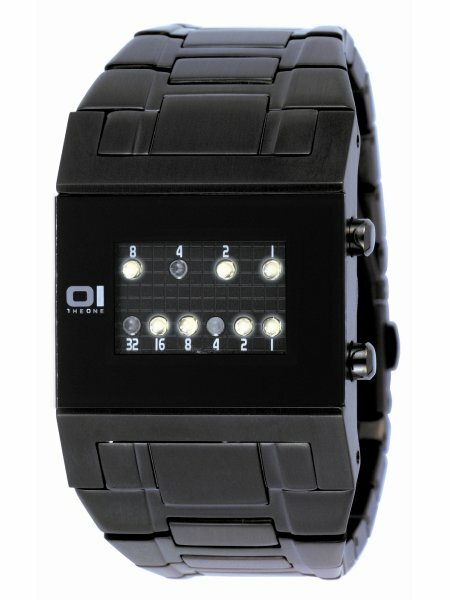 The watches of Binary OI are innovation and trend in one. They are a real must for enthusiasts and collectors. These trendy watches show the current time not with watch hands but in a binary system. Two rows of diodes shine in different combinations. The LEDs in the upper row stand for the hours with the numbers 8, 4, 2, 1. The LEDs in the lower row stand for the minutes with the numbers 32, 16, 8, 4, 2, 1. The time is always visible � without watch hands. After a short time you can read the time very easily and by the way it sharpens your mind. The watches of Binary OI are delivered with a detailed instruction sheet. However, we are shure that you can leave it away after a short time.